The 1950s were a turning point in American history. It was during this decade that television and the microwave oven became popular, rock and roll music hit the charts, electric musical instruments were perfected, computers were being introduced, jet airplanes replaced propeller-driven aircraft, space exploration began, the civil rights movement advanced, and the interstate highway system was launched. Both Bill Gates and Steve Jobs were born in the 1950s. These are just a few of the extraordinary things that happened during the 1950s which significantly changed forever the way we live. Although much attention has been given to the 1960s for the achievements during that decade, it was really during the 50s when things really got started. The 60s were mostly a continuation of the things that had originated in the previous decade. The 1950s were when it really got started! Let's not forget it! CAN YOU NAME THESE CELEBRITIES? TIME: Calendars, Clocks, Watches, Movies, etc. Don't Miss an Issue - It's FREE!! Preview my new book, FREE online: There's lots of nostalgia! it's the untold, true story of racial conflict in a small, Southern community in the late 50s. Two young boys, one white and one black, grow up during the civil rights era and confront prejudice, fear, and uncertainty. 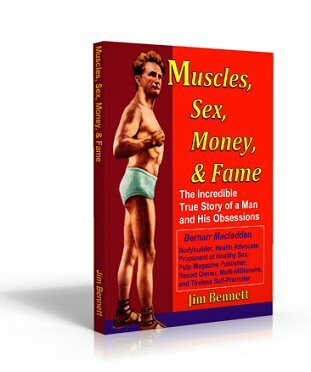 A spectacular pictorial biography of the amazing life of Bernarr Macfadden (1868 - 1955), the "Father of Physical Culture." With over 300 vintage photographs and illustrations. The most comprehensive collection of photos about Macfadden ever published in print!